After perusing one of the many cookbooks I have bought over the years–usually for some fund=raiser or as a memento, I decided I would actually USE them and started with Tea-time at the Masters. 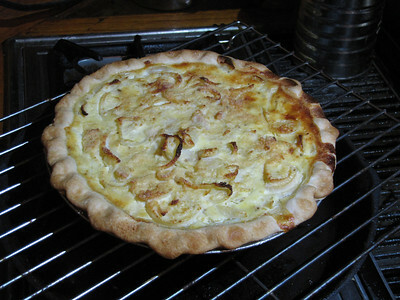 Onion PIe sounded intriguing and I made one for a group of ladies–my husband heard about it and wanted to try it. It looked as nice as the first one and was a nice accompaniment to a sit-down dinner. But then what wouldn’t be tasty about lots of onions, butter, and sour cream?